Are e-cigarettes the perfect disguise for smoking pot in public? Twenty states and Washington, D.C., have legalized the medicinal use of marijuana, and two states (Colorado and Washington) have legalized the substance for recreational use. So what's the next logical step? Smoking pot in public? Perhaps that's pushing the envelope too far too fast, but some marijuana smokers have found a clever way to sidestep that "inconvenience": the electronic cigarette. Battery-operated e-cigarettes — which are not federally regulated — have picked up steam (no pun intended) in recent years as a less harmful option for cigarette smokers. The devices are expected to gross up to $1.7 billion in sales in 2013, and it's possible that the sale of e-cigs will surpass the sale of traditional cigarettes by 2047. So it's not surprising that some pot smokers are getting a little creative with the portable gadget. It emits an odorless vapor, after all, and — when used for its intended purpose — vaporizes liquid nicotine, not tobacco leaves. When used for marijuana, smokers must use cannabis in wax or liquid form, not flower form. And when someone is "vaping" in public, it's impossible to tell what substance he or she is imbibing. Liquid marijuana might sound baffling, but it does exist and is a very popular item in Denver and Boulder, Colo., marijuana dispensaries, selling "rapid-fire, everywhere," said Jessica Eileen, manager of Fresh Baked Dispensary in Boulder. 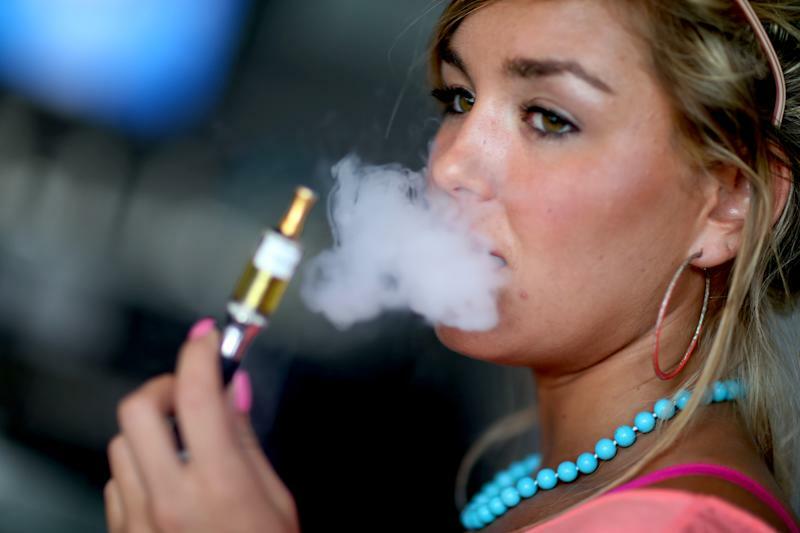 And the form of e-cigarettes called vapor pens are commonplace at pot shops,she said. "I think everybody [sells them]," Eileen said. In fact, Eileen is confident that the overall trend of pot smokers using these convenient gizmos will not burn out any time soon. "It's growing very rapidly, and there are so many other pens that are coming out, too. I kind of think that it's going to be the future of smoking," she said. Christina Salerno, 28, who splits her time between New York City and Los Angeles, offered to share with Yahoo News a recent run-in she had regarding this trend. "I met this dude through OKCupid … and we met for a date in Venice [Calif.] along the beach. After about an hour or two, he stood outside the bar and literally smoked a real cigarette, and then he came back in and pulled out his e-cigarette," Salerno said. "He didn't blatantly say, 'Oh, this is pot.' Just context clues: We were talking about medical marijuana and vapor stores and different vaporizers. Then, he said to me, 'Well, I don't want you to think I'm a pothead … I just like to smoke when I'm doing mundane things.'" While he tried to backtrack, it's needless to say that it was a first and last date for the two, Salerno said. "I felt like this is a whole different breed of weird I'm going to have to deal with in California, because people smoke e-cigarettes in New York, but I don't think people in New York have caught on that you can put weed in them — at least, in my experience,"she added. While Salerno's date and many others are repurposing their e-cigarettes for marijuana use, there are plenty of individuals who are not keen on these devices, even for nicotine use much less for marijuana. New York Assemblywoman Linda B. Rosenthal introduced a bill in 2012 to make the sale of e-cigarettes to minors illegal. "Once you try electronic cigarettes, you can become hooked to them, move on to cigarettes and then move on to other drugs," Rosenthal told NBC last year. New Jersey, New Hampshire, and Maryland have already barred the sale of e-cigarettes to minors.